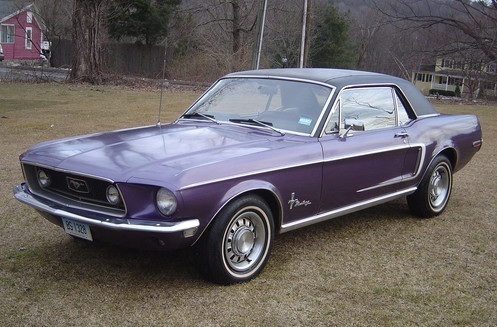 There was no proliferation in the use of "purple" as an automobile paint color in the 1960's and 1970's. Unless you remember the Plum Crazy MOPARs from 1970, you have probably never seen a classic that was painted purple on the assembly line. In the 1967 production year one could order any GM vehicle in Royal Plum except the Corvette. It was a half year color and those cars today are very rare. 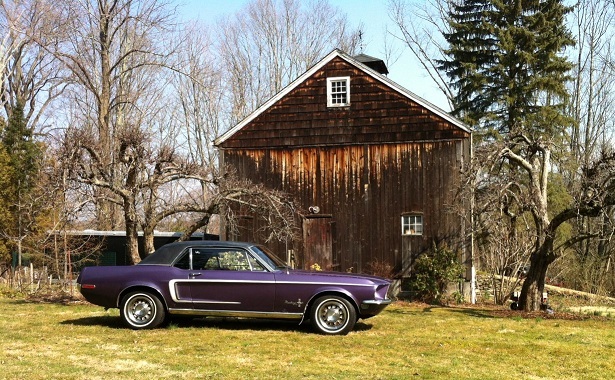 Seen less frequently than the Headless Horseman, this 1968 purple metallic, special paint WT9810 coupe is more than likely one of only a handful ever built. "WT 9810" is a special paint code. The New Jersey assembly plant produced over 100,000 Mustangs in 1968. Only a small percentage of those cars would be special orders. The special orders included Shelbys and unique customer cars. This car was specially ordered by the dealership. Special paint cars were ordered for a variety of reasons. Dealers used the cars to promote special sales. This particular car was ordered through Keating Ford in Stratford, Connecticut. The dealership closed in 2007 after 85 years of business. The car came equipped with a black vinyl roof, automatic transmission, a console and power steering. The car also had the Sprint "B" option. The 1968 V-8 Sprint options included the C-stripe, a pop open gas cap, wide oval tires, steel wheels and the GT style fog lamps. Many people mistakenly believe the turn signal hood was part of the package, but it was not. This car has the plain hood. Just over 15,000 V-8 Sprint cars were built. 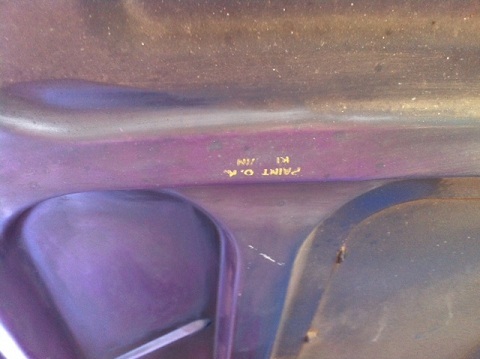 The build tag has a notation "SPECIAL PAINT WT9810" to let the assembly line workers know this car would be purple! [Note: VIN has been modified in photo]. The warranty tag on the door has no color code. Special paint cars always have a blank space over color. If you have a special paint car, it may be very difficult to identify the original color. The best method is to obtain a special paint selector book and attempt to match the color to an existing color chip. Special paint colors are not listed in Ford records. A build tag or a build sheet would also be helpful. Originally, these colors did not have names. Often times names were assigned by dealers or owners. It's always good to go back and search newspapers because these cars were often associated with special promotions. Bill found this car on eBay. He was pleasently surprised when he opened the trunk. 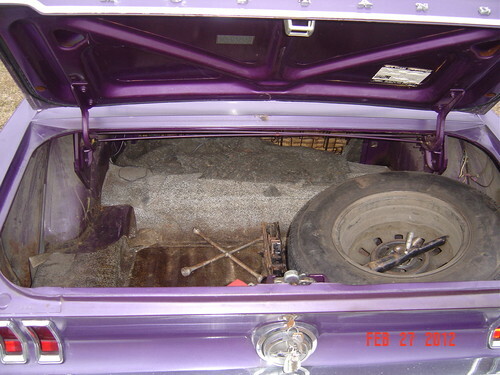 The original jack, spare and trunk mat were inside. Studying New Jersey production cars gives us insight on how the Shelbys were built. This car could have been on the assembly line with a car destined for Ionia right behind it. It was built on May 16, 1968. 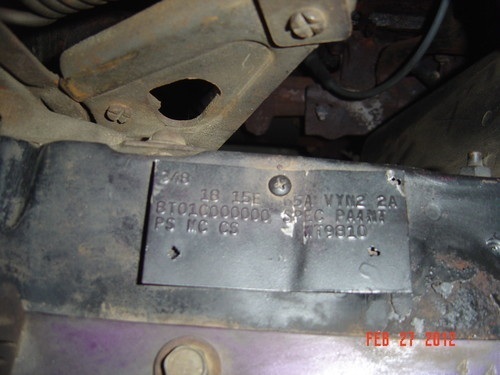 The original paint inspector inspection stamp on the bottom of the hood. Shelby hoods were done in Michigan, so this is a Mustang only detail. This one says "PAINT O.K. KERWIN" Kerwin's stamp can be found on many 1968 Shelbys. The website will do a story on paint stamps in the next update. Factory purple, you gotta like that! If you have a special paint Mustang and would like to see it on the website, please email me. Bill also owns this purple Camaro and likes Barney the Dinosaur!